Comet 209P/LINEAR may create a new meteor shower on May 23-24, 2014. Even if cloudy skies or bright city lights hamper your ability to see the much-anticipated meteor shower this weekend, you can still listen to it on the radio. 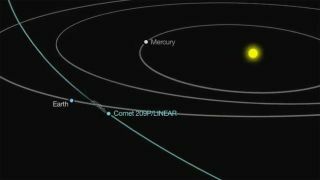 On Friday night and early Saturday morning (May 23-24), Earth will plow through debris shed over the years by Comet 209P/LINEAR. The result likely will be a new meteor shower, and possibly a spectacular meteor storm of 1,000 or so shooting stars per hour, experts say. Such high-frequency (short-wavelength) radio signals generally pass unimpeded through Earth's atmosphere in straight lines; they cannot follow the curvature of the Earth to reach a listener beyond the horizon. Yet when certain layers of the upper atmosphere become ionized, they can reflect the signals back to the ground far away. The lowest such layer, 60 to 70 miles (96 to 112 kilometers) up, is called the "E layer" of the ionosphere — and that's the altitude where the majority of meteors are seen. So, when a meteoroid vaporizes as it passes through the atmosphere, it briefly ionizes air molecules along its path. Forming an expanding column or cylinder several miles or more in length, these ions can scatter and reflect radio waves, in much the same way that jet contrails scatter sunlight, leaving a glowing trail in the darkening sky after sunset. But because the ion trails disperse rapidly, the reflected radio waves generally last for only a few seconds. Tiny particles tend to vaporize at the bottom of the E layer. Large particles, in contrast, begin to flame higher up. And predictions for the particles shed from Comet 209P/LINEAR suggest that most of them will be large. Such meteors produce longer-lasting ionization, and since they start to "flame on" higher up, they can reflect signals from more distant transmitters. On the ground, a meteor's appearance is signaled by the momentary enhancement of FM reception from a distant station. For this to work, find a frequency where no nearby FM station is broadcasting. You'll have the best chance of success by scanning the low-frequency end of the FM band, below 91.1 MHz. The low end of the FM dial is where the lower-power stations, chiefly run by colleges and universities, are found, and they're usually free from local interference from high-power commercial stations. In fact, unless you live in a very unpopulated region of the country, your chances of finding an open frequency free of interference above 91.1 MHz is rather small. Therefore, you should tune to a distant station on a clear frequency below 91.1 MHz. Normally, you will just hear a hiss of noise when you're tuned in to an "empty" radio frequency, but as meteors zip in through the atmosphere, a distant, silent station will abruptly "boom in" for anywhere from a fraction of a second to perhaps several seconds. You might also hear what initially sounds like a "pop" or whistle, and then, as the ionization trail dissipates, the station will quickly fade away. Because of their height, meteors best reflect signals from stations 800 to 1,300 miles (1,300 to 2,100 km) from you. If you are watching for meteors while monitoring your radio, most of the time, you will hear a "ping" of reception but won't see a corresponding meteor streak in the night sky. Recall that most of the meteors you're "hearing" are roughly halfway between you and the radio station, about 400 to 650 miles (650 to 1,050 km) away, so they are occurring either near the horizon or just below it. Back in the 1970s, members of the Nippon Meteor Society in Japan who made extensive records of radio meteors noted that only 20 to 40 percent of radio meteors were simultaneously observed visually. What if you can't find a clear frequency? It may be difficult to find a clear or empty FM frequency on the radio dial, especially if you live in large metropolitan or urbanized areas. In many ways, finding a clear frequency seems to go hand in hand with trying to find a dark sky free of light pollution; you'll probably have a much better chance in rural or country locations. But if you can't find an FM frequency to work with, don't despair. You can still listen for meteors on Space Weather Radio. Radio engineer Stan Nelson uses a Yagi antenna in New Mexico to detect 54-MHz TV signals reflected from meteor trails. When a meteor passes over his observatory — ping! — there is an echo. It's the next best thing to a giant government radar! For more details, visit spaceweatherradio.com. Good luck, and good listening!